As you can imagine, drones competing in the Drone Racing League (DRL) like to go fast. As for how fast, the DRL has just set an impressive new record for other drone racers to aspire to. A RacerX drone built by DRL director of product Ryan Gury, alongside DRL engineers, achieved a Guinness World Record today for the "fastest ground speed by a battery-powered remote-controlled quadcopter," clocking in a top speed of 163.5 miles per hour. 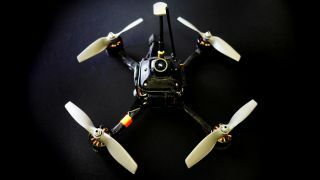 The drone weighed 800 grams (1.76 lbs.) and is capable of rotor speeds of up to 46,000 RPMs. Though Guinness recorded the RacerX's average speed at 163.5mph for its record, the speedy little aircraft's top speed actually peaked at a breakneck 179.6mph. Though DRL's achievement is certainly worth a notice to any drone enthusiasts out there, the failures were apparently just as entertaining from a spectator's perspective. According to DRL's press release, earlier prototypes of the record-setting racer drone burst into flames from the rig's overwhelming power which, as far as we're concerned, officially makes drone racing the closest we've ever gotten to real-life F-Zero.